The content within this article reviews a boil and bite mouthguard from the company Shock Doctor. This item named Nano Double Mouthguard is designed to protect an individual’s jaw and teeth from impacts encountered in sports and martial arts related activities. In addition to discussing about the product’s features, I will also talk about my personal experience using the Nano mouthguard for striking, submission grappling and mixed martial arts training sessions. *An important thing to note is that the Nano mouthguard is not designed for individuals using braces. Color Options: The Nano Double is available in blue, carbon and red. Mouthguard Type: Shock Doctor’s Nano is a boil and bite style mouthguard that allows individuals to easily mold a secure fitting mouthguard at home. This provides great convenience, since it does not require these individuals to get teeth impression from their dentist. The following video exhibits how to properly mold and fit the Nano as well as other boil and bite mouthguards from Shock Doctor. As shown in the video above, this mouthguard can be boiled again and re-fitted if the initial attempt was not completed correctly. 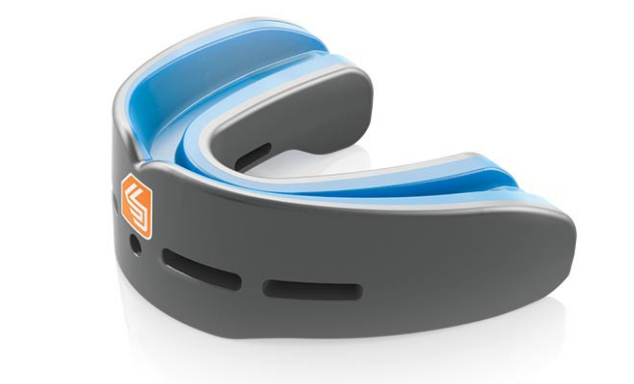 Mouthguard Straps: This mouthguard has a slot for connecting a mouthguard strap as shown in the image below. This will let you use the Nano for sports that utilize helmets, such as football. However, the mouthguard strap does not come with the purchase of a Nano mouthguard. Dual Protection: Nano mouthguard has gel cushions that absorb the shock felt by both the upper and lower jaw. The upper portion consist of a full gel cushion while the bottom layer only has three designated spots. The following images display the bottom layer padding before the mouthguard has gone through the boil and bite process. 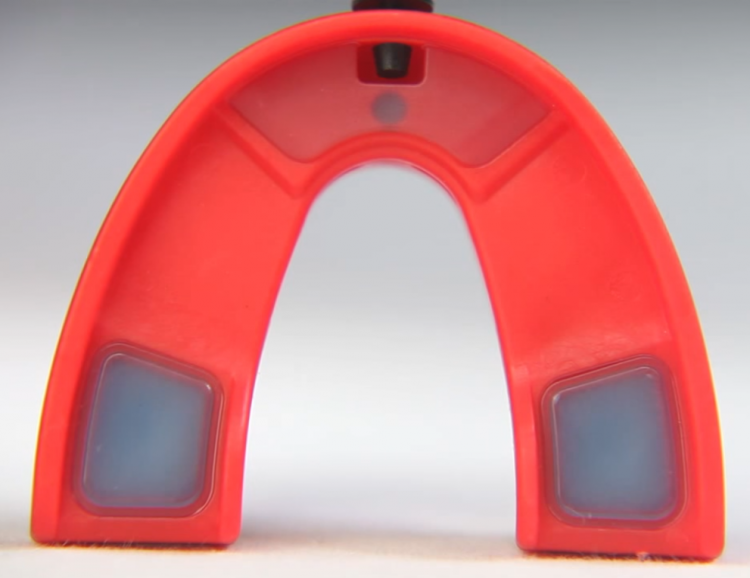 Breathing Channel: Nano’s breathing channels consist of four holes that permit the user to breath through the mouthguard even while biting down on it. I have used the Nano Double mouthguard for over 3 years and found it to still give me a tight and secure fit that does not easily pop out of place upon impact. However, boil and bite mouthguards normally cannot compete with the more expensive custom molded mouthguards that require a visit to the dentist, in terms of fitting. The breathing channels for the Nano Double is a nice concept, but to this day I still struggle to get much out of its design. Therefore, you should not be too reliant on breathing out of the Nano’s air holes during sparring sessions. It is also important to have a hygienic habit of consistently cleaning the mouthguard and its breathing channels to prevent bacterial growth. It is definitely hard to speak clearly with the Nano Double mouthguard in place, which commonly results in muffled sounds that is hard for teammates to understand. Therefore, I end up removing my mouthguard a lot if I need to discuss about techniques or sparring observations. My teammates with the custom molded mouthguards do not have as hard of a time speaking. Shock Doctor’s solution to impact absorption involves constructing the Nano Double so that the gel cushion and its double sided support structure distributes and reduces the brunt of the force. Furthermore, its design helps align your jaw appropriately to improve the effectiveness in protecting your jaw from jarring via impacts. The Nano Double mouthguard is a quality product that has proven to be tough and durable. However, I have noticed dents forming on part of the bottom portion of the mouthguard. These dents most likely occur from situation where a high impact force caused the teeth on my lower jaw to dig into the plastic portion of the mouthguard where the gel paddings are not present. Despite that, I have not observe any actual damage to from my lower teeth as a result, yet. Even though the product description states that this mouthguard utilize a low profile, I found it to be relatively bulky. Of course, the trade-off is the extra protection and jaw alignment features. I have saved myself many times by wearing this mouthguard in sparring sessions. A lesson I learned early on is the importance of having a mouthguard at all times regardless if it is a light or hard sparring session. For a relatively inexpensive mouthguard, the Nano has provided me great protection over the years.